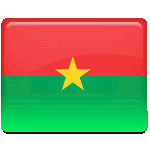 Republic Day is celebrated in Burkina Faso every year on December 11. This is the most important national holiday in the state, that is why many festive events are organized in the capital of Burkina Faso. France claimed the rights of the territory of present-day Burkina Faso (then Upper Volta) and its neighboring territories in 1896, by capturing the capital at Ouagadougou. Upper Volta became a part of the colony of Upper Senegal and Niger, then it became a part of the French West Africa. In 1932 the colony of Upper Volta was split up for economic reasons, and it was reconstructed again in 1937 as an administrative division under the name of Upper Coast. During the 1950s the French Overseas Territories were subjected to revision and reorganization, giving local authorities more power. During this process the autonomous Republic of Upper Volta was established on December 11, 1958. Upper Volta declared full independence from France in 1960 and changed its name to Burkina Faso in August 1984.